I wanted to pop on here and share a quick recipe post with you guys. If you follow me on Instagram, then you know our lives the past three weeks have been CRAY-CRAY (yes, I said that) with VBS and swimming lessons. So, I could write a funny post but I don’t have any witty discourse or jokes to tell today. Even my kids are starting to look at me like I’ve gone bananas. Can I get a witness? I need approximately 4 weeks at home to recuperate. 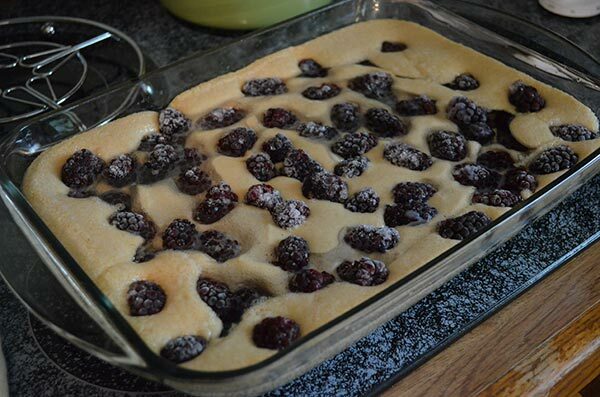 I started making it as soon as I was married because it’s so easy and it’s a great dessert to serve to guests, take to potlucks, or even send to someone who needs food – and really, who doesn’t need cobbler? It’s healthy because it has fruit. True story. I have not used cantaloupe or watermelon because…well, it just wouldn’t end well. And those deserve to be eaten alone in their glory or with a small smackeral of salt. I’ve made this in the past for a dairy-free/egg-free friend using coconut oil instead of butter and almond milk instead of dairy milk. There is no egg, so it’s naturally egg free. You could probably make it gluten free by using a gluten-free flour, but I haven’t tried that…so, don’t shoot me if it doesn’t work. Also, if you use coconut oil, don’t quite use 1/2 cup…maybe only 1/3 cup? 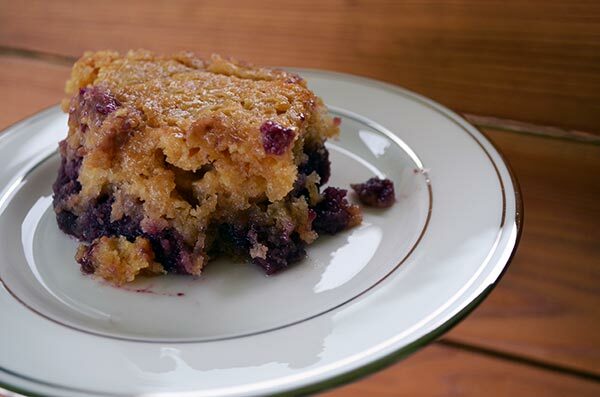 1/2 cup tends to make the cobbler a bit oily. This doubles very well and fits in a 9×13, but I usually bake as-stated in an 8-9 inch square dish. Here you go. Also, cut me some slack if you see me in public – I might have that dumb-look stare on my face. What day is it? Melt butter in an 8-9 inch square dish in an oven set at 350. While the butter is melting, prepare the batter by mixing flour, sugar, baking powder, salt, milk and vanilla until smooth. Remove dish from oven and pour batter evenly over top. DO NOT STIR. Sprinkle fruit evenly over the top of the batter. DO NOT STIR. Bake at 350 for 40-50 minutes or until browned and bubbly. Dairy-Free/Egg-Free option: use coconut oil instead of butter (only 1/3 cup) and almond milk as your milk. I make this all the time. I love the dump, no stirring method! 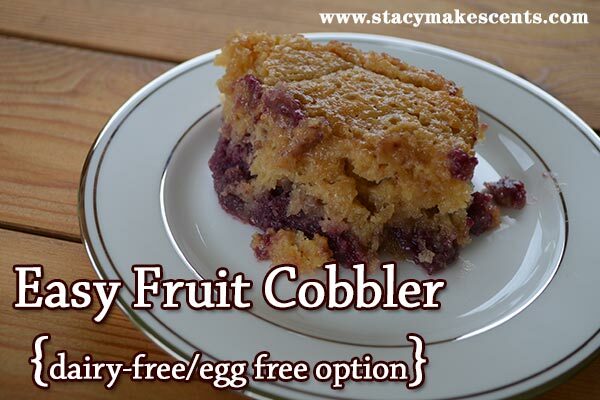 I also make a FANTASTIC dump cobbler in the crock pot! I love my crock – it’s working right now. Do you think whole wheat flour would work? can I use frozen berries? or does the fruit need to be fresh? Ok! I’m going to make this! Thank you so much for sharing this recipe. I love your blog. And today I’m grateful that you shared about being a Hermit Introvert. I can relate! This is the same cobbler my Mom always made do of course it’s the only way I make it too. Anything else is not cobbler! Yum! I want some…now, with vanilla ice cream please! Of course! Vanilla is the only way to go. I have used this recipe also for years. It’s the best. I have been making it with gf flours also for years. No one knows any better and loves it! I actually cut back on the sugar to 3/4 c but I sprinkle sugar on top. :-)) yum!!! Thank you Stacy! This is EXACTLY what I needed to see today! Yum. 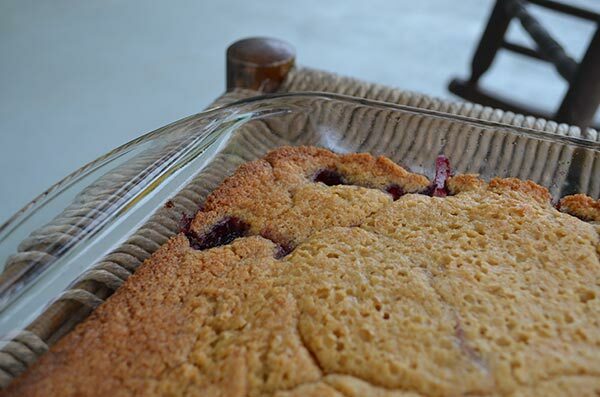 I have made cobbler just like this with gluten free flour. It can be done!